Today´s yin yang yoga will allow you to ease into going with the flow in your day and your life. It combines the best of yin yoga for the wood element, liver and gallbladder meridians with qigong inspired fusion yoga. In this yin yang yoga class we will focus on going with the flow to connect with the qualities of wood element in balance, qualities like kindness, acceptance, patience, compassion, benevolence. An ability to go with the flow. We will do so by pulling and pressurizing the tissues of the liver and gallbladder meridians and embracing the balanced qualities of the wood element. These poses affect the inner thighs and side body, but also the liver organ. 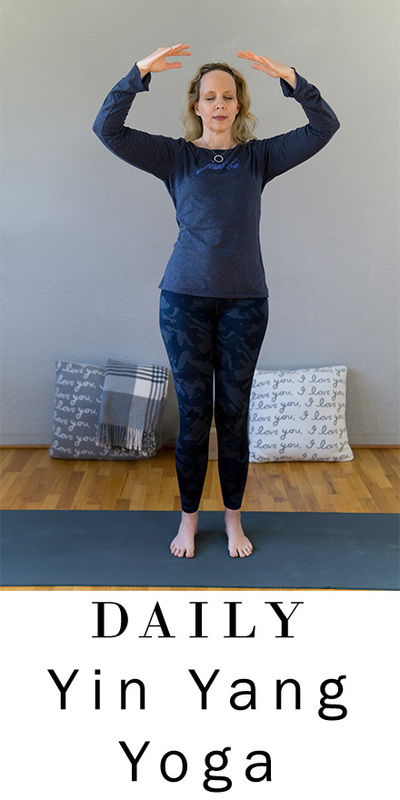 The yang portion of the class combines poses like mountain, chair pose, warrior one pose, and goddess victory squat with flowing qigong movements that allow us to go with the flow. Today´s yin yang yoga gives a taste of five element courses that are available in our membership community. We have a fire element course coming up as part of our membership offerings in May of 2019. We all have the five phases of wood, fire, earth, metal and water within us. Each element exists to nourish all others and in return, to be nourished itself. The movement of our being are like the tides of energy expanding (yang) and contracting (yin) as we are carried along the currents of life. In each week of the five element fire course we have dharma talks, discussion (in online forums and in class with two way video), self practice of yoga, pranayama, contemplation of poetry and time in nature. Applications are available for members of our community, we would love to welcome you into our community. To find out more about the application process and requirements email admin @melissawest.com or watch the livestream from April 11th on Facebook or YouTube. Members can apply in our community.